Life Magazine, March, 1991. Multi. Paper. 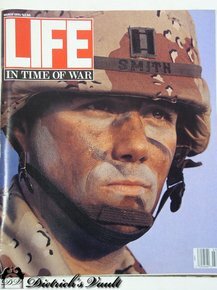 The cover of this original issue is titled, "In Time Of War." It shows the head of a Gulf War American Captain in full camouflage. The issue contains five articles on the war. You will receive a discounted TOTAL price of $35.00, if you purchase all of the Pages in this Issue. Note: Click here to contact us if you would like to purchase individual Pages from this Issue.